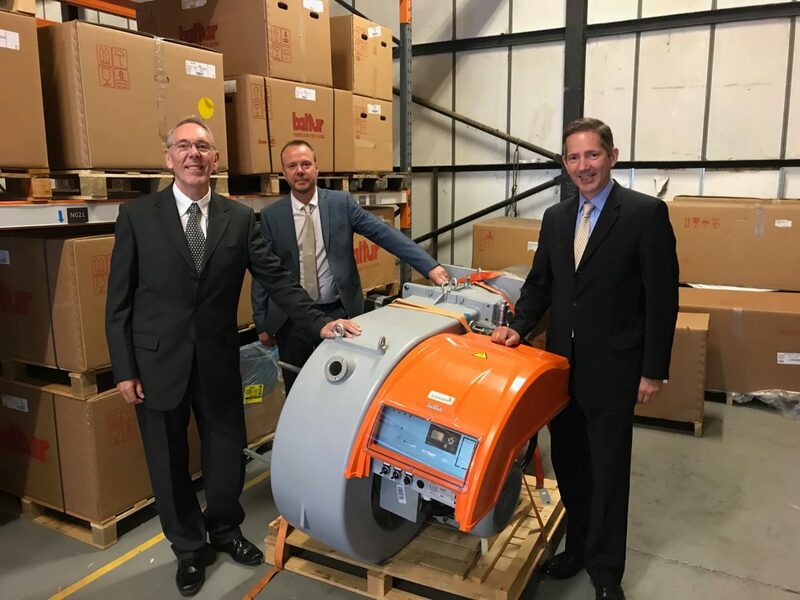 Huntingdon MP Jonathan Djanogly visited EOGB Energy Products Ltd (Friday 22 June) to view the latest innovation in off-grid, oil heating technology. Mr Djanogly was welcomed to EOGB by Managing Director Paul Barritt and Technical Director Martin Cooke, where he received a tour of the facilities and learnt about the company’s new blue flame domestic oil burner, Sapphire, which is due to be in production later this year. The Sapphire burner not only satisfies the new NOx standards set by the Energy Related Products (ERP) Directive from September 2018, but also meets the even lower 2022 requirements well ahead of time. Unlike other low NOx burners, Sapphire has a fully-modulating operation to deliver ultra-high efficiency. It is also fully integrated with OpenTherm technology which can be connected to a range of advanced in-home controls to further drive up efficiency, and offers a gateway to SMART interactive systems previously not available on oil fired installations. The Sapphire burner has also been successfully tested using HVO (Hydrotreated Vegetable Oil) as an alternative to oil. This work supports OFTEC’s proposals to decarbonise the UK’s 1.5 million off-grid homes by converting them to a low-carbon liquid fuel, a goal that supports the government’s Clean Growth Strategy ambitions. During his visit, Mr Djanogly also officially opened EOGB’s recently developed R&D facility. The new space, which is double in size, enables engineers to test several burners and boilers on long-term cyclic tests. It also allows for sophisticated NOx emissions and smart controls testing for new generation equipment.